I AM INSPECTOR JOHANN P. HEINRICH, ORIGINALLY OF GERMANY, but of late I reside in a flat just above a quaint café in central London. I have had published works in The Times on a good handful of occasion. I tell you this, dear reader, so that you do not doubt the sincerity and professionalism I bring to light today. I am not an arrogant man, nor am I exceedingly humble. I state facts in an interesting manner, nothing more or less. The events I record now are hardly my own, but rather a tale of an extraordinary detective and his ever-faithful friend. I regret to announce they both wish to remain anonymous. Let us alter their identity by calling them Hamish and William Scott. When I express to you that Scott is an intelligent man, do not mistake me by categorizing him with the likes of Aristotle or Socrates. Our friend has little knowledge of the workings of the universe, and has no patience for philosophy. He is, in fact, more of a Da Vinci, a meticulous observer who can classify different types of ash and deduces the secrets of total strangers simply by standing in their presence. I dare to give away his identity if I say much more. Scott and I were both becoming renowned for our detective skills. We were simultaneously summoned to America to assist in an ordeal most urgent. It would seem the famous writer, Edgar Allen Poe, had missed his liaison in Philadelphia and was now nowhere to be found. Several wealthy benefactors of the writer’s acquaintance were offering large sums for his safe return. Immediately, I purchased a ticket on the newly minted steamship SS Great Britain, and though she was as true a vessel as any, I found myself out of sorts for the greater portion of my journey. Fortune favored me, as I had chosen the very same liner Scott and Hamish had boarded. Thus, we three practically flew to New York City in fourteen days together. Scott, Hamish, and I remained in close contact during our travel over the sea. Whenever we deliberated the facts of the case, I felt akin to a pupil, ready to take notes whenever Scott chose to speak. Amazed, was I, to witness how much he could glean from very little face-value facts. Judging by the choice of words used in the telegram and his prior knowledge of Poe, Scott felt quite certain that this case had nothing to do with the writer’s drug or alcohol addictions. I had my doubts, but was anxious to witness Scott’s work to prove his theory correct. In the moment our feet landed on solid ground, we were given a most insistent telegram. It seemed Poe had been discovered in Baltimore. We three were to rush to his side. “Why ever for?” I grumbled, hardly recovered in the least from the bucking of the sea. We were given first class seating on a train that would take us to Baltimore. It was early October, and the countryside was breathtaking. The air was quite comfortable for any European abroad. I was keen to enjoy myself before alighting upon a scene that would prove most grim, but Scott was a distraction. He was brooding, aloof, and often mumbled to himself as he puffed on his pipe. If I hadn’t known better I’d say he was a man scorned, but Hamish assured me it was a normal disposition for the dear detective. I was far from surprised, but no less displeased when we arrived in Baltimore to learn that Poe was indeed on his deathbed. From the train station, we were ferreted away by a lavish landaulet drawn by a swift gelding of the finest sort. All efforts had been made to retrieve us as hastily as could be. When we arrived at the house where Poe was being made comfortable, we were brought into the tea room by a stone-faced doorman and made to wait. Scott became as unhinged and nervous as a man awaiting a firstborn. 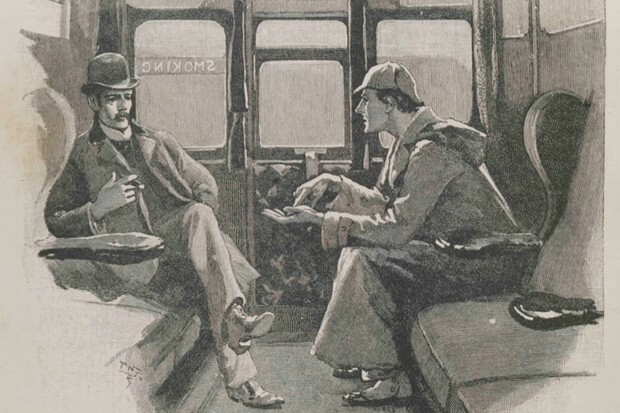 He paced and mumbled, he wrung his hat and puffed his pipe so exorbitantly the room was cloudy with smoke. A man arrived, stocky with a thin black beard, and was announced to us as Constable Jacobs. Hamish and I greeted him politely, but Scott was far too worked up for pleasantries. “Did you receive my telegram?” Scott asked immediately. Then he spoke to them, one by one. At times he would be cordial and strike up conversation, and other times he would be curt and hardly ask a thing. There were many bewildered faces in the room as he interrogated in his own manner, but his face was as sharp and focused as surly as the Creator’s had been when he made man. Scott wrote nothing down, but I do not doubt he could recite their accounts without omitting a word. So intently listening was I that when the nurse entered and announced Poe was as fit as any to be seen, I nearly leapt out of my skin. We were brought down a corridor to a guest bedroom. The room smelled of lavender soap and freshly washed linens. Inwardly I was cursing the nurse who had taken care to freshen up the bed and victim, as surely all evidence of Poe’s plight had been washed away, too. Scott said nothing to the famous writer as the man lay in the throes of a dying fit. Drenched in a diaphoretic sweat, shaking, pale, and thin, Poe neither heard nor saw us as we approached him. Scott took his hand, and for an instant I wondered if the detective had found some compassion for the ailing soul, but I was reminded of his nearly mechanic mind when he began to examine beneath Poe’s fingernails. Poe expired within an hour of our examination. Eyes open, mad, sweating and plagued with despair and darkness, he left this world. I said a prayer. Hamish re-interviewed Poe’s attending physician. We all did what we thought made sense at the time. We tried to make ourselves feel useful, to feel as though we hadn’t travelled from so far only to fail so completely. Scott was hardly moved by our failure. He was a hound on the hunt.